Banbury United manager Mike Ford had mixed emotions after seeing his side extend their unbeaten Evo-Stik League South run to three games. 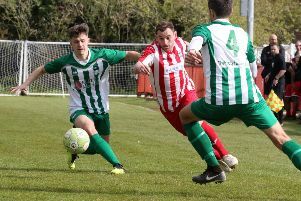 The Puritans came from behind to earn a 2-2 draw in Saturday’s premier division central clash at St Ives Town where Ricky Johnson grabbed a late equaliser. United found themselves 2-0 down with just four minutes on the clock following goals from Jack Newman and Danny Kelly. Giorgio Rasulo reduced the arrears with a fine volley before the break. St Ives were reduced to ten men when Newman picked up a second caution on the hour mark and Johnson rescued a late point. United were rocked from the start, keeper Martin Conway’s long clearance found Ben Baker, the assistant flagged for a foul by Kelly on Matt Taylor but referee Stephen Bates waved play on. United stopped and Baker cut in, Manny Agboola saved the initial effort but Newman knocked in the rebound. After a discussion with his assistant the referee allowed the goal to stand much to the dismay of the United players and bench. Eddie Odhiambo and Harry Whitehead combined on the right to set up Steve Diggin who beat Conway but his shot hit the post. United fell further behind when Munashe Sundire clipped a pass over the top, Agboola’s clearance fell to Kelly 40 yards out and he returned the ball over the head of the stranded keeper and into the empty net. United reduced the arrears in the 18th minute when Greg Kazibondi laid the ball off to Rasulo who hit a first time volley from the edge of the box into the bottom corner of the net. In added-time Agboola tipped over a header from Newman and then denied him again from the ensuing corner. St Ives were reduced to ten men on the hour mark when Newman got his second caution. United boss Mike Ford tried to several ways to get back on level terms before throwing Johnson up front in the closing stages. It paid off in the 84th minute when St Ives fail to clear a cross from substitute John Mills, Kazibondi headed it back into the six-yard box where Johnson took advantage of a mix-up and prodded home from close range. Ford told Puritans Radio: “We’ve picked up a couple of points from losing positions and that’s five points in a week but it’s mixed emotions after that. “Having gone 2-0 down in four minutes, you are happy to get a point. It was a great comeback to get a point but the players are disappointed not to have won it. “We played excellent in the first half despite going 2-0 down. We told the players at halftime to be patient.